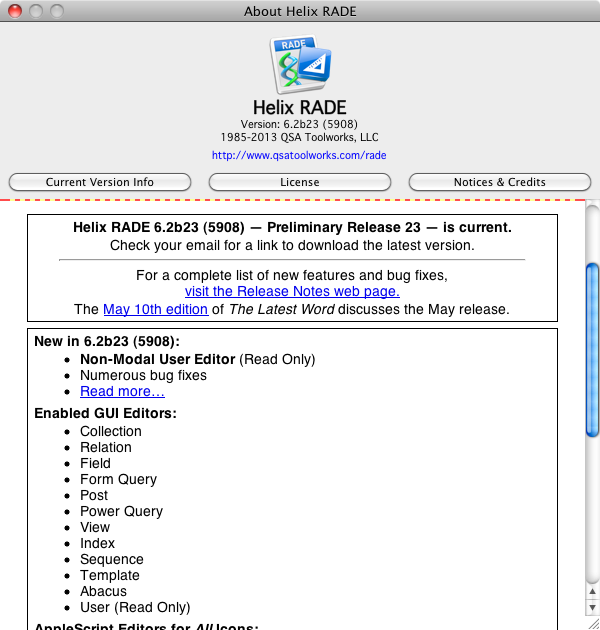 10 May 2013 — Even as the finish line gets moved a bit, the race becomes considerably shorter today with the twenty-third Preliminary Release of Helix RADE 6.2 for macOS. For those who haven’t joined us yet, the subscription plan has ended. But for a limited time, you can still pay $480.00 and get Helix RADE 6.2.x, which includes today’s Preliminary Release 23 as well as the final release, which will be delivered as soon as it is complete and ready for prime time, hopefully some time between now and June 10, 2013. At some point in the near future, we will be setting upgrade pricing, at which point the savings that are to be had by joining the Europa Pioneer Plan will be no more. Preliminary Release 23 provides the first look at the last piece of the Helix RADE for macOS puzzle: the User Editor. It also provides fixes for a nasty assortment of defects that have found their way into RADE during the development process. As always, you can find all the details of what has changed since the last Preliminary Release in the Preliminary Release 23 Release Notes. For now, let’s talk about Helix users for a moment, both as icons and people. As noted above, today you get your first look at the new Helix RADE User Editor. Like the template and abacus editors — the two most recently added editors — the user editor has turned out to be a two-month project which takes us quite neatly to the end of the second year of the Europa Pioneer Program. This month, you can see that the user editor is still a work in progress, as we present it in ‘read-only’ form. To actually use it to create and modify user icons, you’ll have to wait until the next release. But the interface is present to the extent that you can clearly see where we are going with this totally revamped approach to editing users. As we have done with every other icon in RADE, the user editor works hand in hand with the Inspector and the Element Panel. Menus, commands, views, et. al. are dragged from the Element Panel (or from any other location) into the user’s ‘menubar’ window, and properties — such as command key equivalents and view permissions — are set in the Inspector. Even though there is little that you can actually do with it this month, we encourage you to open a familiar user in the editor see how it looks. Click on the menus and menu items to see how their properties will be configurable in the Inspector. We won’t get into any detailed discussion of the user editor here because, as we said, it is a work in progress. Instead, we thought this would be a good time to reflect more broadly upon the concept of the “user” in Helix. Because Helix gives you tools that let you distinguish between users of a Helix collection — among these, the user editor and the Username abacus tile — the informed collection designer can apply them to access the full power of the relational database at Helix’s core. We intend on exploring that power in the next edition of The Latest Word, but for today, let’s examine the other side of the ‘user’ coin: the person sitting in front of the computer, looking in. In order for Helix to survive, it first had to be dragged, albeit kicking and screaming, into macOS and over to the Intel processor. But the painfully long conversion is nearly complete, and we are ready to start shifting our focus to what Helix needs to survive and thrive. In a word: Users. New users. Helix was never a mass-market product, like a game or a word processor. As a software development tool, its appeal was — and still is — to those brave enough to undertake the process of controlling the destiny of their own data, bending and shaping it to best serve their own informational needs. The original intent of the designers of Helix was to put as much power as possible into the hands of individuals who wanted to do this. Conversely, purveyors of off-the-shelf database applications prefer customers who do not want to do this. These companies have always wielded an outsized influence, portraying the do-it-yourselfer as a tilter at windmills. Why learn something you can use any way you like, their argument went, when it is so much easier to conform to someone else’s idea of how to manage your information? Programs that enable users the way Helix, FoxBase, 4D, Omnis and even FileMaker did were historically painted with a brush of impenetrability. Helix in particular was singled out by the Macintosh media as “iconoclastic,” as though being different than everything else available, as though bestowing power on mere end-users, were somehow bad things. When we undertook the process of bringing Helix to macOS, there was nothing quite like Helix available in macOS. Because the conversion process was going to take years, a big risk was rooted in the question of relevance: would Helix still be relevant when the job was done? The concepts behind Helix are now nearly thirty years old, but the idea of architecting and building data management structures with icons instead of hard code is still a very worthwhile and viable notion. There are many individuals — as well as new entrepreneurs and small business owners — for whom Helix would still provide a fresh new way of taking control of their data. Of course, today’s potential Helix customer may be just as likely to turn to a “cloud-based solution” for their data maintenance needs as to doing it themselves. But as each new breach of security ends up exposing sensitive customer data to identity thieves, the innovative way Helix couples the power of relational databases with the ability to control and safeguard the storage and distribution of data becomes even more appealing. While Helix has always been — and still is — an innovative concept, it has never been an easy concept to market; occasionally, some of the messages associated with Helix have even had the effect of putting the product at odds with its own potential customers. It has long been our intent to improve the messaging used to market Helix, but until we arrived at the place we now stand, marketing could not be part of our active vocabulary. Since this drive got underway back in 2004, we have strived — quite successfully in fact — to stay as far out of the spotlight as possible. As long as Helix was a product that required an older computer and an older operating system, the odds would remain stacked against new sales. We had to depend on ourselves — meaning us and you — to get from there to here. But now we are ‘here’ and it is time to start expanding the Helix user community. Before we can successfully market Helix, we need to know who its customer is. In today’s environment, hundreds of thousands of narrowly focused apps seem to cater to a nation full of people on data overload with very limited attention spans. But surely today’s entrepreneurial individuals and workgroups aren’t running their business on some combination of Pages, Numbers and Angry Birds. There are those who wish to rise above the noise, who look at their data and wonder about the deeper connections. About how to use that data to better serve their own — or their customers’ — needs. These are the Helix users of the future; they are us, just younger. We (all of us) need to put our heads together and find how to make Helix appeal to these people. So who, or what, is a Helix user? What characteristics might they have in common? How do we reach them? We will be attempting to answer these and other questions over the coming weeks and months. But we don’t want to do this alone or in a vacuum. We are going to engage you to help us focus our efforts, because we believe that you — and especially those among you who went into your pockets to help underwrite the development of RADE — have a vested interest in seeing Helix survive and thrive. When we were preparing to scale the mountain of code we needed to grapple with to bring Helix to macOS, we conducted a series of surveys. Those of you who participated helped us define how we would proceed. Now we’re in a place where we want to do that again, but before we start, we want to jumpstart the process by framing the discussion to our current thinking. This is only a jumping off point; we could be completely wrong in any or all of our assumptions, but we have done a great deal of thinking and talking about this time, and we believe that a good place to begin is for you to understand our thinking about who the Helix user is. Just as Helix RADE has two operational modes, Design Mode and User Mode, there are, broadly, two types of Helix user. On one hand is the person who uses Helix RADE to create the application. This “Design Mode User” may be building an application for his (or her) own use; maybe for his own business, or maybe for someone else. From our standpoint, that person is our customer, driving the sales of all Helix products, improving applications as new needs are identified and new features become available. On the other hand, there is the person who uses a Helix application on a day-to-day basis. He (or she) may or may not have been involved in the creation of the particular Helix application being used. But inside that Helix collection there is an icon with their name on it and, if the collection is properly designed, a ‘users’ relation holding a record linked directly to the icon that bears their name. That person has most likely never seen Design Mode, and knows Helix only as Helix Client, Helix Engine, or possibly User Mode of Helix RADE. Both types of Helix user are defined by what he or she knows. The first type of Helix user knows that he or she can easily adapt their Helix-based application as their needs change and their understanding grows. Does the second type of Helix user know this? They should, and it falls to us in the first group to inform them of this capability. Helix is for the square pegs out there who are tired of attempts to pound them into round holes. These are not people who have heard about how dumb they are for so long that they’ve begun to believe it themselves; These are the ones who refuse to believe that. They may recoil at the idea of “writing a program” to meet their needs, but that’s only because they don’t realize they can do exactly that with Helix RADE. We’re providing this short insight into our thinking to spur you to start thinking about these issues too. If you disagree with us, rest assured we will give you an opportunity to say how and why. We put a lot of announcements on this web site. Virtual tons of verbiage tend to be overwhelming when you’re looking for that needle in the haystack. Our original promise to be more forthcoming with information than our predecessors may have, if not backfired, probably not had the desired effect of keeping people properly informed. One such announcement bears repeating now that Helix had moved wholly into the Intel world and as old Macs continue to die. It’s the one about buying hardware online. If you decide to buy from a mail order website, please don’t forget about our link to amazon.com. QSA gets a small commission on everything you buy, if you start your shopping by clicking on one of the links on our site, such as these on the right. As has been noted on several occasions, the process of converting Helix from a Classic application to macOS has had as an inevitable consequence the generation of lots of new bugs. Some of these merely bubble under the surface, annoying but manageable. But some are outright pests threatening to undermine the entire process. The freedom we always knew of being able to work on a template knowing we could save or discard the changes at any time has now been extended to every icon in the Helix toolkit. Unfortunately, this nascent high-wire act sometimes gets hit with a cross-wind and committing or reverting leads to a crash. We fixed one main culprit responsible for this, but there are still a few instances of it around, and probably more yet to be discovered. Preliminary Release 23 is better, but it’s still wise to keep as few windows open as necessary and to commit (and save) early and often. One of the major features introduced in Helix 6.2 is the expansion of the copy-and-paste (or save-and-apply) structure function so that it is now possible to replace an entire collection’s structure all at once. This gives collection designers the ability to completely revise a collection structure in an offline copy and then to update the live collection structure at any time. No worrying about tracking all the changes so that the individual small clippings cover all of the changes. No more need to meticulously apply them in a specific order to avoid broken links. For professional developers, this is a truly liberating feature. However, as more users have pushed this further along, new limitations — some of them in macOS itself — have been discovered. Fortunately, Helix is smart enough to see trouble coming and responds with an error message and an abrupt shut down. Not fun, but at least the collection is kept safe. Reports of some new limitations have come in recently, and this release addresses those, making this feature more capable than ever. These are just two of the bugs that have been fixed since our last report. As always, the Preliminary Release 23 Release Notes details everything that is new in this release. That one thing is the completion of the user editor. The next time you read a new edition of The Latest Word, we fully expect be telling you that the journey to macOS is finished, and that we can now take off our shoes and socks, roll up our pantlegs, and frolic in the surf. And then we will put our socks and shoes back on and get back to work. But we will no longer be playing catch up; we will be looking to the future. And so, here is our last appeal: We still want to get as many of you as possible up and running in the new Helix RADE before we revise the pricing. Last month we said you only had until May 31st. Though it may end up stretching out a bit longer, we urge you to do it now if you are thinking of doing it at all. There is still time to save money, but that time will soon be past.